In just a moment, you’ll find out whether or not you’re ready to get your first four figure client in the next 36 days. (But please note — you might not be). Before you do though, here’s a quick peek at my background and experience. Since 2002, I’ve discovered — and more importantly, successfully executed — sales and marketing skills across a range of industry. From FMCGs (Fast Moving Consumer Goods) to the Creative Industries (Media, Advertising and Design), I’ve put the individual approaches you’re about to learn to the test. And the fact is, they work. But only when applied correctly. Even with years of proven experience, I found myself low on sleep, low on cashflow, and high on anxiety. (I was up before sunrise each morning, after going to bed just a few short hours earlier. I thought that spending 18 hours a day obsessing over how to get a client and put money in the bank would be a good use of my time. The rub? Even though I knew what needed to be done to get a well paying client, I didn’t have a clear, step-by-step system (based on the principles which I knew worked) that I could follow to get predictable results. You can imagine what it’s like to have your gut churning each morning, from the moment you wake up. To force yourself to break past the mind numbing paralysis, and stop stressing about where the next dollar would come from. And whether or not you’ve got enough money in the bank to keep going. Not to mention the stress that it will put on a new marriage (mine at the time), friendships and your own personal head space. There are plenty of reasons why most of the people you know think it should take you months — or even years — to ‘crack the code’ and become completely financially independent (without busting your gut). But what if you could address each of these ‘reasons’ in mere days — instead of years? Imagine how confident you would be in your ability to land four figure clients, again and again, if you had a system that you could follow to get predictable results. Would you do the work? If you’ve got the skills and knowledge to help a business achieve it’s goals, and it’s a service you wish to provide, then it is unethical to both you and them to not provide it. And if you want a chance at getting a four figure client, you’ll need to follow a laser targeted plan. This Approach Is Not For Everyone. To get straight to the business of helping people and being paid four figures for it for it, you will be asked to do very specific things. Some of which may make you uncomfortable. Can you step outside your current comfort zone? If you can, and if you can follow the instructions laid out for you across the 36 day program, you will be doing things that most other people won’t. Want to find out if Your First Four Figure Client is the right approach for you? ”The best thing I took away from this course was “TAKE ACTION”. Repeat. For the people that are the right fit for Your First Four Figure Client, the approach is unquestionably effective — invariably landing them a four figure client in 36 days or less. Instead of letting overwhelm or shiny object syndrome get the better of them, successful graduates of Your First Four Figure Client stick with the task at hand on a daily basis. Of those people who purchase Your First Four Figure Client, the ones that see results are the ones that open — and act on — every one of the 36 daily emails. How do I know? Because I can see who opens each email of the course, and see who I get replies from. There is no free ride with Your First Four Figure Client. The course is comprised of 36 daily emails with action steps, as well as accompanying templates, scripts and frameworks. If you execute on the instructions, you will create a feedback loop. The more you do, the more feedback you get. The more feedback you get, the faster you’ll improve. And the faster you improve, the quicker you get your four figure clients. A good product deserves to be promoted and advertised. But if you don’t have a good product — a set of skills, in this instance — you are not ready for Your First Four Figure Client. Your First Four Figure Client is based on executing — not on being original and innovative. You see, originality and innovation are excuses that beginners use to avoid doing the work. They convince themselves that instead of following a proven system developed by others, they have to do it their own way. This does not work, and is a waste of your time. Focus on getting your first four figure client first, and delivering results to them. Once you have mastered this, you can begin to experiment and innovate. But first, follow the instructions. 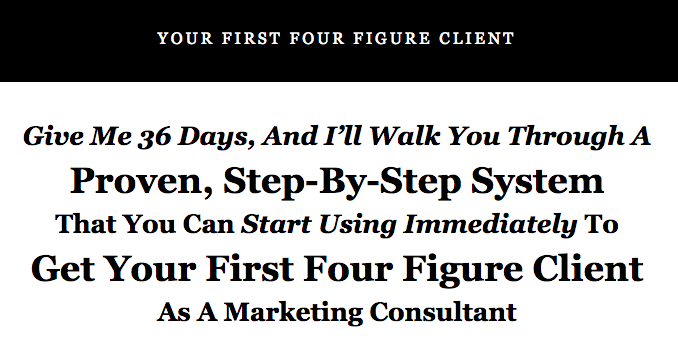 Your First Four Figure Client is not about making you feel good (although you will). This course is about walking you, step by step, through a proven system to generating four figure clients in a predictable way. And to do this, you may need to realise that some of the techniques you’ve used (or beliefs you’ve had) are wrong. If you are prepared to be wrong, you’ll be open to new ways and new frameworks. And these new ways and new frameworks will lead you towards getting your first four figure client. At this stage, you will know if you’ve got what it takes to land your first four figure client in 36 days or less. If you’re an action taker, you’ve probably found that the values of the course are the kind you believe in: Do the work, follow instructions, get results, leave your ego at the door. In that case, I’d like to invite you to find out exactly how the course works. With this information, you’ll be able to make a final decision about whether it’s the right approach for you to land a four figure client in the next 36 days. Before you can purchase Your First Four Figure Client, you’re invited to discover exactly how this game plan can land your first 4-figure client in 36 days or less. It’s important that before you get access, you truly understand what you’ll be getting access to. This approach ensures that you’ll be making the right decision. The “Top Down View” is a walk through of how the entire Your First Four Figure Client course works. In it, I’ll explain to you how each of the five weeks works, and what you can expect to achieve in it.